He bears the great head of the jackal on his shoulders. He is the god of all those who have passed on from this world and into his realm of darkness. He is even a member of the great Ennead, one of the nine original gods of the world. He is none other than the great god of the dead and embalming himself, Anubis! Have you ever dreamed of becoming a great, divine Egyptian ruler? It's always been something we've figured would carry a little too much responsibility. Take our buddy Anubis for example, he has to watch over all of those funeral rituals and make sure they're done just right otherwise he'll probably have to produce a plague or invoke his wrath upon the entire town. That sounds like quite a bit of work. We are pretty sure those Egyptians followed the rituals and orders of the gods pretty well though so maybe by now we'd just be some sort of awesome looking figure head who doesn't have to do anything except graciously accept or approve of the offerings. We'd just get paid to look intimidating! Though we're pretty sure if we're not careful the Egyptians would be a little upset if they found out we didn't actually possess the head of a jackal. Which is exactly why we have to make it look as awesome as possible. This black and gold costume complete with muscles is perfect for sitting on the throne and scaring people into thinking your a god. 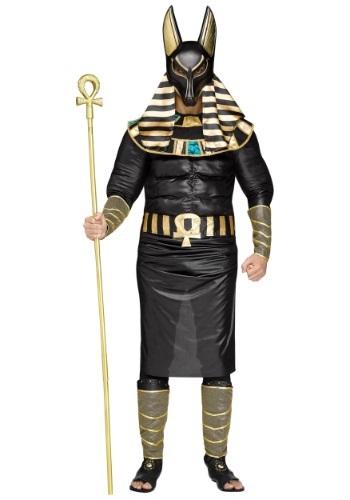 Well, that and it's a pretty sweet outfit for your next Halloween or Egyptian themed party! Just be sure not to talk about embalming too much. It's kind of a gross process.